• Special geometry with supporting edges for using in high speed machining. 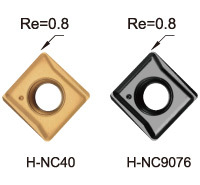 • Utilizes standard NC Spot Drill holders, also can fit with WSP ( combined spotting and chamfering 145°+90° ), Corner Rounging insert. • Applications : • Spotting, engraving, grooving and chamfering on milling machines, machining centers. • Spotting, facing on CNC Lathes. to making hole max. Ø6, Ø8, Ø10, Ø14, Ø22 and Ø25mm. •Spotting, engraving, grooving and chamfering on milling machines, machining centers. •Spotting, facing on CNC Lathes. 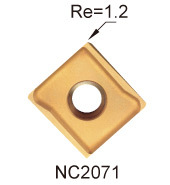 NC2071 : K20F grade, for unhardened steel & cast iron. Each insert has 2 cutting edges. •Spotting, engraving, and chamfering on milling machines, machining centers. 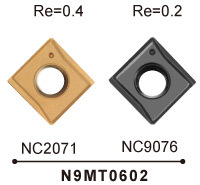 NC9076 : K20F grade, for non-ferrous material. -Each insert has 2 cutting edges. •Spotting, facing, turning on CNC Lathes. K20F grade, for unhardened steel. Each insert has 4 cutting edges. K20F grade, for non-ferrous metal & cast iron. K20F grade, for universal steel & cast iron. Good for high speed machining. K20F grade, for non-ferrous material. 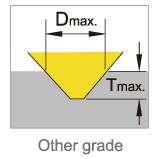 Sharp edge and excellent surface finish on non-ferrous material. P35 grade, for unhardened steel. 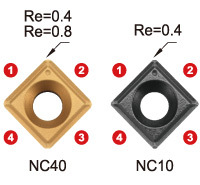 K10F grade, for non-ferrous metal & cast iron. 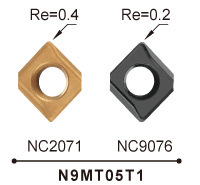 Cermet insert, for hardened steel up to 56 HRC. K20F grade, for unhardened steel & cast iron. •Spotting and chamfering on milling machine, machining centers. 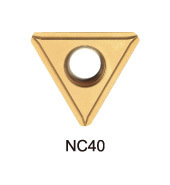 NC40 : P35 grade, for unhardened steel & cast iron. Each insert has 3 cutting edges.